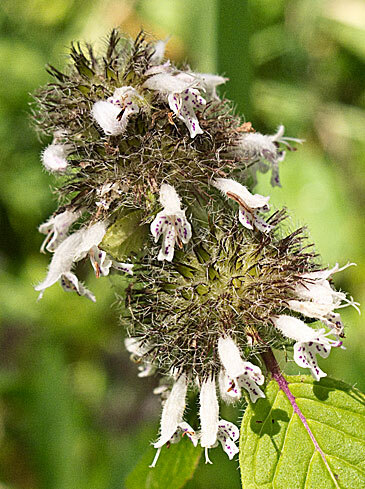 This mountainmint is a clump-forming aromatic perennial that typically grows 1-3’ tall. It is native to Eastern North America. 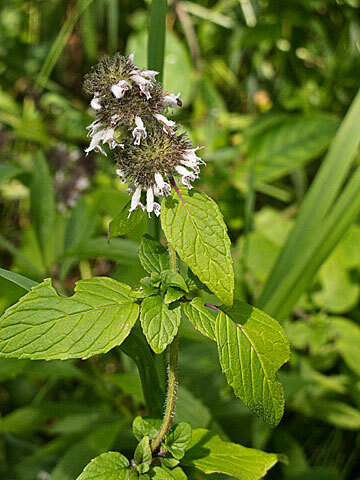 This densely leaved mountain mint features dark green leaves which have a strong mint-like (spearmint) aroma when crushed. Branched stems (mostly square in cross section) are clad with nearly sessile, ovate to ovate-lanceolate, acuminate (pointed), dark green leaves (to 2 1/4" long) with round to heart-shaped bases and toothed margins. Plant foliage is topped in mid to late summer by a bloom of two-lipped tubular pink flowers (each to 1/2" wide) in dense flat-topped terminal (sometimes axillary) clusters, with each cluster being subtended and highlighted by a pair of unique and showy silvery fringeless leaf-like bracts located near the base of the cluster. Leaves can be used to make mild tea. Native Americans used this plant for treatment of fevers, colds, stomach aches, and other minor physical ailments.